The presence of RBC partially or completely obscuring the morphologic details of cells in serous fluids, makes it difficult for the cytolog ist to give an accurate diagnosis. Many methods have been suggested for treatment and fixation of haemorrhagic fluids. In view of our restricted resources, we have tried out three methods selected on the basis of simplicity of processing, low cost and easy availability of reagents. The three methods selected were: haemolysis by a) glacial acetic acid, b) Carnoy's fixative and c) normal saline rehydration technique. A comparison was made between the three methods for lysis of RBC on thirty randomly selected grossly bloody serous fluid samples. Various parameters such as an improvement in diagnostic accuracy, ty of nuclear features were compared. The saline rehydration technique was judged to be superior to the other two. RBC whe persistence of RBC in the background and the effect of the lysing agent on claritere completely lysed and there was no distortion of nuclear features of epithelial cells in the large majority of saline treated cases. A retrospective analysis of the cytological appearances of all solitary nodules presenting in the thyroid gland was carried out over a period of thirteen months in order to establish the number of cases of Hashimoto's thyroiditis presenting as a single nodule. Of three hundred and thirty one thyroid aspirates, one hundred and thirty cases of solitary nodules of the thyroid were observed, of which sixty nine were proved at cytology to be an adenomatous nodule of a goitre, thirty one were chronic lymphocytic thyroiditis (Hashimoto's). Eight cases of colloid cyst, four cases of follicular neoplasm and two cases of papillary carcinoma were also observed. Sixteen out of the one hundred and thirty cases proved to be haemorrhagic/scanty, where no opinion could be given. The result of this study shows that chronic lymphocytic thyroiditis can present as single nodule in the thyroid and this has to be kept in mind when dealing with such nodules at aspiration. Aspiration cytology & imprint cytology have been comparatively evaluated in 50 cases of breast lumps with that of histopathological examination. In imprint cytology criteria for differentiating benign from malignant lesions were cellularity, cell size, pleomorphisim, N:C ratio, nucleolus, mitotic activity and smear background. Most of the patients presented with lump in the upper & outer quadrant of right breast. The accuracy rate of aspiration cytology was 94% and imprint cytology was 96% in this study. 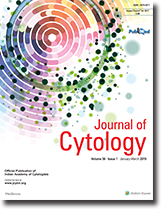 Aspiration cytology alone is not conclusive in many cases. It is beneficial if aspiration cytology is combined with imprint cytology especially in clinically doubtful cases or in cases with inconclusive aspiration reports, to reach 100% accuracy. The effectiveness of FN AC in both benign and malignant thyroid lesions was assessed in relation to histopathology. The study was carried out on 183 patients who were later subjected to thyroid surgery. Thyroid specimens were available for histopathologic examination in all these cases. On the basis of FN AC, 160 patients were found to have benign thyroid lesions where as 23 cases had thyroid malignancy. Colloid goitre and colloid goitre with hyperplastic foci comprised about 84.3% of cases. Papillary and follicular malignancies of thyroid formed 56.5% and 34.7% respectively. Histopathologically, 151 cases were found to be benign whereas 32 cases were malignant. Only 9 cases were wrongly diagnosed as having benign lesions by FNAC. All cases diagnosed by FNAC as malignant lesions were later confirmed by histopathologic examination. The accuracy of FNAC in diagnosing malignant thyroid lesion was found to be 95% in our study. Granular cell tumor (GCT) is a rare tumor of the soft tissues. GCT can be diagnosed by fine needle aspiration cytology. We report herewith a case of a 29 year old female presenting with swelling on the back diagnosed as granular cell tumor by FNAC andconfirmed by histopathology. A case of metastatic medullary carcinoma thyroid in 56 year old female is presented. The diagnosis was made on FNAC and confirmed by histopathology. The cytomorphologic features of medullary carcinoma of thyroid are highly distinctive and are discussed in this report. Role of alkaline phosphate (AP) in fine needle aspiration (FNA) smears was evaluated in two cases of osteosarcoma (OS). Clinicopathological features were reviewed. In first case of primary OS clinicoradioiogical features were equivocal and cytomorphology suggested a malignant round cell tumour. Staining forAP on FNA smear was negative. FNA provides fresh material fot enzyme studies, which might be helpful in the disputed cases.